October 11th was a spectacular fall day at Quarry Ridge for the Ni Design golf outing with colleagues and friends. Finish Line – 4 new locations! 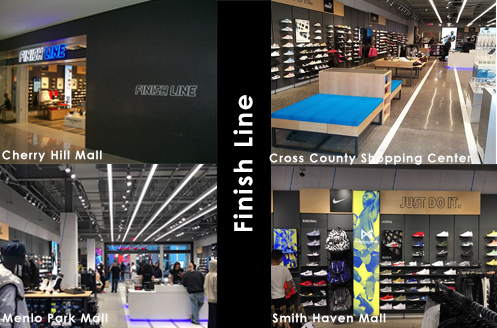 Finish Line has remodeled and opened 4 new Simon Mall locations designed by Ni Design. Check out more photos on our portfolio page! Click here to see portfolio page! July 18th was a great day at Rockledge Golf Club for the Ni Design summer golf outing – It was a fun day with colleagues and friends. The Ni Designed Papyrus in the Prudential Center had its grand opening in October! Please check out our portfolio page for more photos! See photos! Coleman in Castle Rock, CO is now renovated and open! Customers love the new Ni Designed store! Check out the before and after photos on our Facebook. Click here to see photos! A new Ni Designed Total Wine & More location has popped up in Corbin’s Corner in West Hartford! Hope you get to enjoy the experience of Total Wine & More’s vast wine selection, wine and beer demonstrations, and wine tasting. Please check out our portfolio page for more photos of our projects! Barnes & Noble has opened a new Gameday Store for the University of South Carolina’s Gamecock fans! The store is located directly adjacent to the Williams Brice Stadium in Columbia, South Carolina.